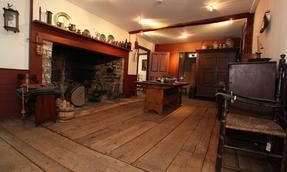 The Society’s two 18th-century dwellings comprising its museum and gallery contain 12 rooms furnished to show the development of domestic life, the economy, furniture, and décor in New England homes, 1740-1910. With two 18th-century houses – the Betts-Sturges-Blackmar house (c.1740) and the Sloan-Raymond-Fitch house (1772) as its central focus, the museum vividly depicts the changes that occurred in homes as the economy, industry, fashion and family life changed from the Colonial period to the consumer society of the late 19th and early 20th centuries. It features period-appropriate paint colors, floor coverings and wallpapers.